Hey, Slayers! Just in time for Valentine’s Day! Entering the Fab 5 Contest is easy! All you have to do is send an email to mailfornancyholder@gmail.com and name your 5 favorite episodes from the Buffy the Vampire Slayer series. The contest is open to Buffy fans worldwide. However, email entries must be received by Monday, February 14, 2011 to be elligible to win. 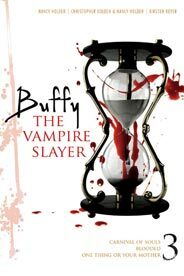 From the elligible entries received, I will pick 5 FABulous winners who will be chosen at random to receive a free copy of Buffy the Vampire Slayer 3 and a signed nameplate from me. I will also tally your 5 favorite episodes from the entries received and reveal your favorite Fab 5 Buffy episodes. This entry was posted on Friday, January 28th, 2011 at 6:03 pm. You can follow any responses to this entry through the RSS 2.0 feed. Both comments and pings are currently closed. Love your Blog, your Books – you’re one of my favourite authors! Fun contest! I’m enjoying revisiting the episodes. Thanks for the chance Nancy! Oh gees … that’s a tough one. To narrow my faves down to only 5! I feel the same way, Erin! I’m glad you’re all having so much fun. I think I might have to rewatch all the eps myself! It’s always a pleasure re-watching the episodes. Ironically I just finished the second omnibus about a week ago, haha. I hope you enjoyed it! I’m rewatching, too! Please be sure to send your entry to mailfornancyholder@gmail.com. Thanks! Hi! Please send your entry to mailfornancyholder@gmail.com. The entries are being compiled at that email account, not here. Thank you! Entries need to go to mailfornancyholder@gmail.com. We are compiling all the entries there. Many thanks! Please send your list to mailfornancyholder@gmail.com. Thanks! LOL on Emmy, and please send your list to mailfornancyholder@gmail.com. ONLY entries sent there will be considered for the prizes. Thank you! Please send your list to mailfornancyholder@gmail.com. We’re compiling all the entries over there! Please send you list to mailfornancyholder@gmail.com. We have a special minion of darkness keeping track of all the entries there. Thank you. I have a theory…that you need to email this list to mailfornancyolder@gmail.com. Andrew is compiling all the entries over there. Thank you! PLease email your list to mailfornancyholder@gmail.com. That is the ONLY place that entries will be counted. It’s a hellmouth thing. Thank you! Please send you list to mailfornancyholder@gmail.com. We’ve hired the Initiative to count the entries over there. Thank you! I was just wondering when we can hope to hear about the finalists? We are working on that right now!! Thanks so much! I cannot wait to hear who the winners were.